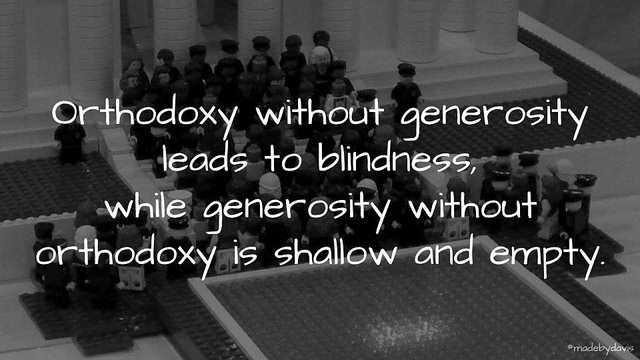 Orthodoxy without generosity leads to blindness, while generosity without orthodoxy is shallow and empty. The challenge is finding balance between the orthodoxy of the past and a generosity to the world of the present. Putting this differently, you need to respect the body you are trying to heal. To illustrate this Gladwell uses the example of a Mennonite pastor, Chester Wenger, who had to give up his position in the church to wed his gay son, but also move the orthodoxy forward. The question that needs to be considered is what you might give up or recognise to bring about a change in orthodoxy? You do not have to look very far online to find arguments why education is broken. Although change is always needed within any organisation, the danger of the ‘broken’ myth is that it portrays everything in every school as being wrong. This call for transformation maybe passionate, but it denies the reality of the past and in some ways the present. Subsequently, when the conversation moves to developing education there are many who are off-side. Although one solution seems to be starting a school from scratch, this does not seem realistic or sustainable. Another solution is to start by celebrating the strengths that already exist within education and working from there. Some recent examples of this are the various interviews on the Modern Learners podcast, with people like Pam Moran and Art Fessler, as well as Richard Wells’ book A Learner’s Paradise. Coming at the problem of ‘generous orthodoxy’ in his own way, Ewan McIntosh talks about the ideas of ‘rocks and whirlpools’. Borrowing from Leicester, Bloomer, Stewart and Ewing’s book on Transformative Innovation in Education, McIntosh talks about the dangers of being pulled too far either way. The challenge is finding a balance between creativity and the status quo, something that is unique to each context. Integrating technology is even better if you reconsider how and what you teach, but that does not mean that students no longer use pen and paper for some tasks. Agency and autonomy is even better when it is not reliant on control and punishment, but that does not mean there are no collective values and expectations. Open planned classrooms work even better if such spaces are adjusted to fit the needs and purpose of the learning at hand, but that does not mean throwing away all sense of order and structure. Relationships with students are stronger when teachers give something of themselves, but that does not mean they lay out their whole life story. The challenge with many of these aspects is that they take time. Students do not become autonomous because there are no more detentions and open planned spaces do not become functional spaces because the rows of tables are scrapped. Joel Speranza captures this dilemma explaining that we can do things fast, but unless we outlay the appropriate capital to back this, it will not be right. If you are going to do something, you need to do it right and doing it right usually takes time and commitment. So what about you? What does change look like to you? Does it involve balance? As always, comments welcome. Generous Orthodoxy and Educational Change by Aaron Davis is licensed under a Creative Commons Attribution-ShareAlike 4.0 International License. I’m not sure I agree that the “broken” myth implies that everything about schools is broken, but there is certainly a lot that could be improved. I think transformation means a transition from one form to another, not a complete exchange. Often I see new ideas and methods taken up with little regard for what went before. That is doomed for failure. As you say, change takes time and commitment, and definitely balance. But schools need to step us into the future, not tie us to the past. Balance with one foot on the past as we stretch forward into the future.